Relax to these 10 pristine original Field Recordings from Crypticon Records. Collected after a mountain forest rainy season, these creek sounds will immerse your soul into the very spots of these places, as single track stereo recordings of pure nature. The Doctor is back in session! Ease your modern day pains with a modern day recording collection of California's finest watery creek sounds. These Field Recordings were captured at a very high quality and minimally processed to bring you direct pristine nature environment tracks available for you here. The microphone was strategically, and in cases, precariously, perched into the brooks, streams and tributaries of the Santa Cruz Mountains during the Winter/Spring season of 2016. WHITE NOISE IS PEACE AND QUIET MASKED! 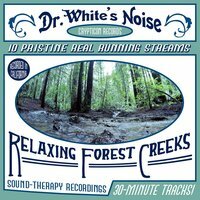 Use the powers of Dr. White's Noise to create a foundation of sound to sleep in noisy environments like rooms with snorers, babies, street noise, creaking walls, hobgoblin sounds and other spooky bumping sounds in the night. Use in dorms or when studying to create a sound foundation that you can concentrate from. Nothing is worse than trying to concentrate only to be distracted by sounds unbecoming that in an of themselves are quiet (chewing gum/clicking pencils/flipping paper etc) but can be distracting in low general ambience environments. Bringing up the level of ambience via these sound tracks is a perfect way to concentrate and keep your brain from lingering off into the silence to try to find the sound that shreds the moment, due to the nature of silence and the sound effect.. Now, the low-impact sounds will be drowned out and essentially cancelled due to living under the tones of these type of album sound environments. White Noise is a science - and Dr. White has his Masters in Field Recording and Sound Mastering from Crypticon Records. * It is advisable to use the restroom before falling asleep to this album! Side-effects are wetting the bed and/or couch, but definitely yourself. We are not liable to replace linens or clothing. Please remember you are not actually drowning in a river if you wake up while this is playing and immediately panic. If the sounds of water last longer than the prescribed 10 half-hour recordings (5 hours) please check that there is not a flood outside and/or the shower is not running and/or shuffle is not selected. It is not advisable to take Dramamine while listening to this album as you will not actually get sick from the water noise. Your balance will be maintained due to the almost-certainty that you are listening to this on land. However, listening to his while in a boat and/or airplane is untested and we eagerly await your trial-by-guinea pig adventure and subsequent comments. We will use your input to better craft this very warning letter. We appreciate your commitment. Doctor White assumes no liability if this album is misused to torture those in dense urban environments with what they cannot have in a vertically integrated city and they come back and hobble you for it. Please use to induce peace where necessary. This very album may be used in riot control in conjunction with appropriate crowd control psychotropic mind sprays. This album will not keep you hydrated via osmosis or telekinetic water drawing powers - please drink a half-gallon of water a day to maintain your humanity. This album will not induce rust, but it would be deemed a form of torture to continually play this album for a robot without rust inhibition coatings - see Steampunk for brass construction of your robots by the way (the Doctor is an avid roboticist between midnight and 3am). Thank you for reading this far, please support us for archiving the audio environments of this planet in this era.